INDIANAPOLIS – (Dec. 20 2018) Beyond Monumental has made a donation of 2,500 winter hats to local charities that assist those in need. 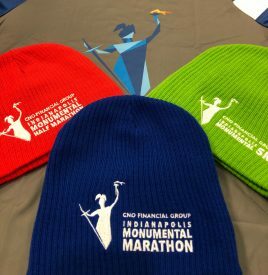 The 2018 finish line gift at the CNO Financial Indianapolis Monumental Marathon, Half Marathon and 5K for all runners and walkers was a commemorative winter hat. The surplus of these hats will now help keep Indianapolis kids warm in the winter months. Since its inception in 2008, Beyond Monumental has donated more than $1.1 million to local non-profits in support of public education. The donation of these hats to charities that support Indianapolis children is a natural complement to their mission of combating community deterioration and juvenile delinquency by promoting health, physical fitness and wellness in the Indianapolis community. Thirteen hundred hats were given to the Assistance League of Indianapolis for Operation School Bell, a program that offers new clothing and athletic shoes to children that live in poverty, helping them arrive at school ready to learn. Since 1984, almost 62,000 Indianapolis area students have been provided new clothing through the program, and since 2000, over 48,000 have received new shoes. For the 2018-19 school year Operation School Bell provided 3,375 IPS, Lawrence, Pike, Warren and Washington school children with a duffel bag packed with a winter coat and accessories, two school uniforms, hygiene kit, and two age-appropriate reading books. 2,851 students received new athletic shoes and a 6-pack of socks. Additionally, over 2,500 students will benefit this school year from Beyond the Bell, a program providing new clothing items directly to elementary schools to assist with immediate-need and emergency situations. Nine hundred hats were donated to another not-for-profit supporting Indy’s kids, Teachers’ Treasures. Teachers’ Treasures provides classroom materials for use in public, private and charter K-12 schools, located in Marion County, with 60% or more of the student population on the free or reduced lunch program. Currently, Teachers’ Treasures assists over 272 schools and more than 4,150 teachers. Teachers’ Treasures will distribute the hats to Indy’s kids via their teachers. Additional donations of 100 hats each were made to Back on My Feet Indianapolis, and the IMPD Initiative: “Keeping Our Neighbors Warm and Fed”. The 11th annual CNO Financial Indianapolis Monumental Marathon experienced record numbers and greater success than ever before, due largely in part to support from title sponsor CNO Financial, and presenting sponsors Franciscan Health, and Apex Benefits. Registration for 2019 event is set to open on January 1, 2019 with special pricing for those who register early.